Facebook is getting shmoopier by the minute: Following the addition of upcoming marriage announcements, the site just unveiled a new feature for parents-to-be: A new Timeline event debuted Monday that lets users break exciting baby news to their social network. 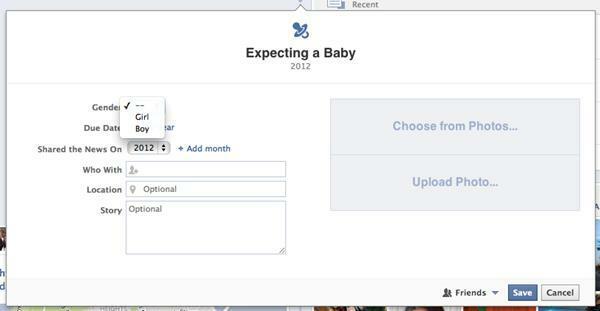 Gone is the “Expected: Child” item in the list of family members, replaced by a new “Expecting a Baby…” option (under “Life Events” in the Timeline publisher). The new feature lets users schedule the announcement and then posts the baby news in two places — in friends’ newsfeeds and alongside birthdays in the Celebrations section, thanks to the “Due Date” field. There are also spaces for identifying the baby’s gender, the other parent and the location info (of where it will be born), plus a generic “Story” field for other details. The part that practically guarantees this feature’s success, however, is the photo upload. Brace yourself, because a tidal wave of ultrasounds is surely on the way. As warm, fuzzy and “awwww”-inspiring as this is, the motivation for the change is probably more savvy than sweet. 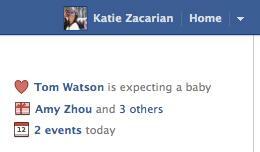 Word has it, Facebook has been eyeballing expecting parents for advertising purposes. It even has options that target this audience already, though there hasn’t been an accurate way of pinpointing them until now. 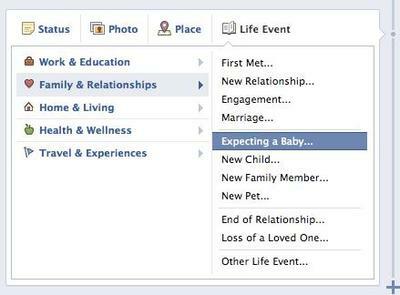 So this new “Expecting a Baby” option is many things to many people — not least of which is a sign of the times. The young hip thing that Facebook once was has definitively come of age now, along with a userbase that has matured and taken on greater responsibilities. The only question left is, if the network reaches middle age or beyond, will there be Geritol apps and retirement Timeline events pegged for sometime in the future?